Nienwohlder Moor. 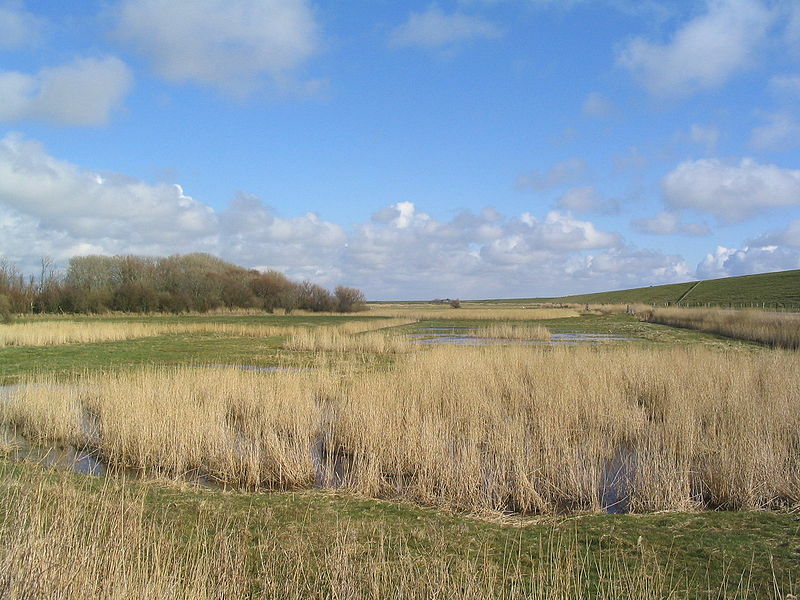 This image by an unattributed photographer on Wikimedia shows the marshiest-looking marsh I could find for present-day Germany. This post is the final one of a series on “The Wilds of Germania,” based on writings by the Roman historian Tacitus. You can find any of the series by typing the word “Germania” in the search box at upper right. In our last visit to Germania, we saw the mutiny of Roman soldiers over problems of pay and length of recruitment. Germanicus managed to promise his way out of the predicament, and the ranks sullenly quieted down. 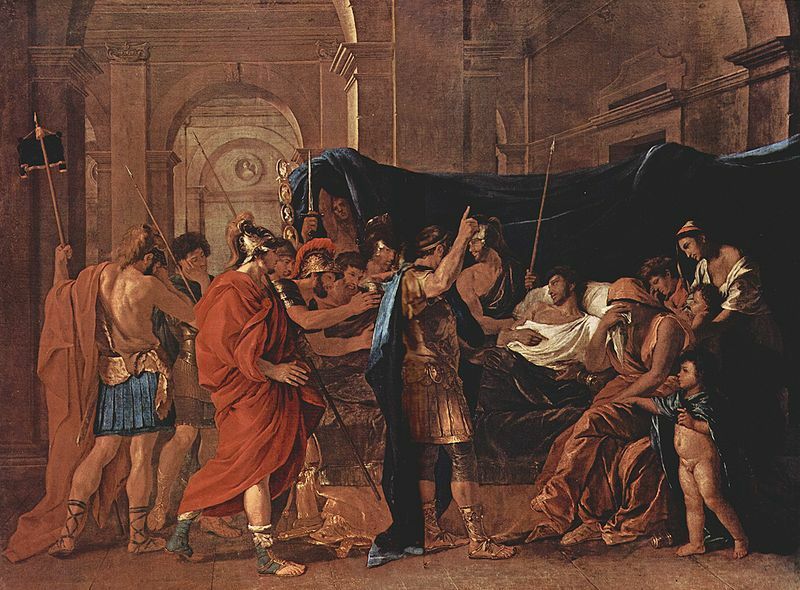 Nothing could do more to revive the spirits of the Roman soldiers than an easy victory with the promise of loot, and Germanicus quickly accomplished this with the massacre of the Marsi. Over the next two years (15-16 AD), Germanicus led his army to fight the alliance of tribes led by the man the Romans called Arminius and Germans now refer to as Hermann. This was the warrior the Romans had thought one of their own until he turned against them in the disastrous Battle of the Teutoburg Forest. The army of Germanicus visited the site six years after the battle and buried the whitening bones of their fallen comrades. Survivors of the catastrophe…pointed out where the generals had fallen, and where the Eagles were captured. They showed where Varus [the Roman commander] received his first wound, and where he died by his own unhappy hand. And they told of the platform from which Arminius had spoken, and of his arrogant insults to the Eagles and standards—and of all the gibbets and pits for the prisoners. After an initial confrontation with forces of Arminius, Germanicus withdrew his legions to the River Ems, and Aulus Caecina Severus took over the initiative. Caecina marched his troops across the Long Bridges, a narrow causeway earlier constructed by the Romans across a swamp. “All round was slimy, treacherous bog, clinging mud intersected by streams.” Caecina set his soldiers to work repairing the old, broken causeway, and Arminius had the Cherusci tribe attack the working parties. Everything was against the Romans. The waterlogged ground was too soft for a firm stand and too slippery for movement. Besides, they wore heavy armor and could not throw their javelins standing in the water. The Cherusci, on the other hand, were used to fighting in marshes. They were big men, too, whose thrusts with their great lances had a formidable range. The Germans were divided as to strategy for the next day’s fighting. Arminius wanted to let the Romans come out of the camp to where he could trap them in the swamp. But another chief called for storming the camp. “Inguiomerus was for the more sensational measures which natives enjoy…that was the way to win more prisoners, and collect loot undamaged.” And so the Cherusci constructed bridges and poured over the parapets of the Roman camp. The [Roman] battalions received their signals, and the horns and bugles sounded. Shouting, the Romans fell on the German rear. “Here there are no woods or swamps,” they jeered. “It’s a fair field, and a fair chance!” The enemy had been imagining the easy slaughter of a few badly armed men. The blare of trumpets, the glitter of weapons, was all the more effective because it was totally unexpected. And so it ended in victory for Caecina. The Romans retired to winter quarters on the Rhine, and the next year Germanicus again raised a large army and advanced across the Weser to meet forces of Arminius at Idistaviso. Here the terrain was more advantageous to the Romans, and they inflicted a punishing defeat with heavy casualties. Germanicus continued to push for more action against the tribes, hoping to subdue them definitively. But Emperor Tiberius felt that it was not a wise use of Roman resources to continue pursuing these wild men of marshes and forests who would always return to fight another day. He recalled Germanicus to Rome, where the commander was granted a triumph—a ceremonial parade—the first full triumph celebrated since the one of Augustus in 29 BC. 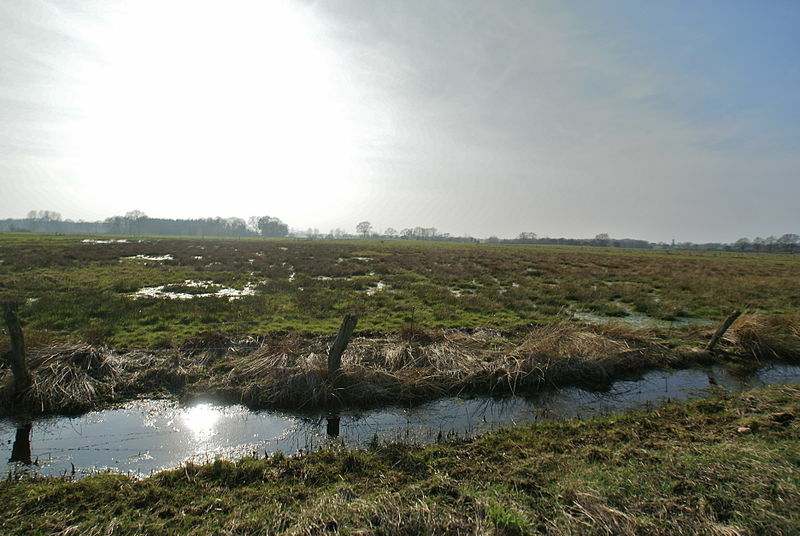 The photo at the top of this post shows a marsh in Holstein, the region north of Hamburg, against the border of Denmark. As mentioned in the caption, it is the only photo I could find that shows anything that really looks like a marsh. The area where Arminius led the Cherusci against the Romans was further south, near the present-day city of Hannover. And marshes in Germany appear to be rather tidy places, controlled by drainage canals and dikes. * Tacitus, The Annals of Imperial Rome, translated by Michael Grant. Penguin Classics, 1959. Murnauer Marsh. Photo by Richard Bartz. Posted by Jenny in bushwhacking, hiking, peakbagging. 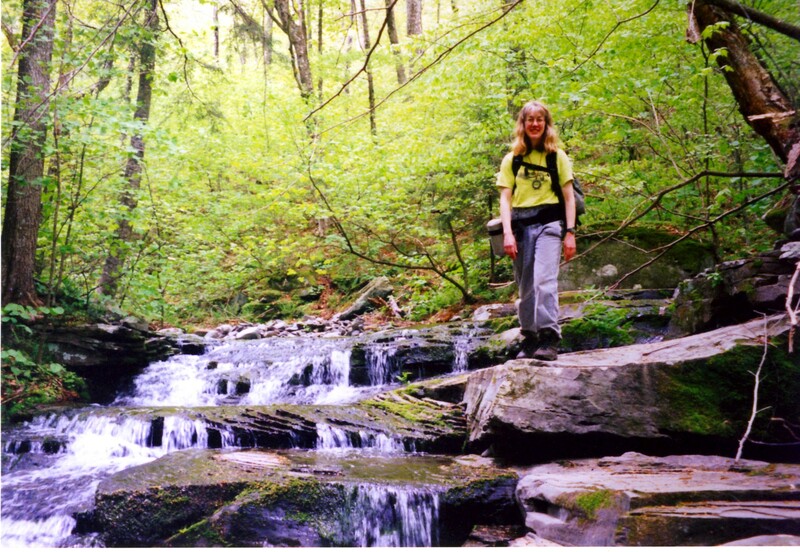 Fellow Smokies explorers, you would probably sneer at the notion of bushwhacking in the Catskills. Sneer not! The Catskills are the most misunderstood, overlooked, underestimated, and oversimplified mountain range in the U.S. I have many fond memories of my adventures working on the Catskill 3500s—all 35 of them, of which 16 are bushwhack peaks. 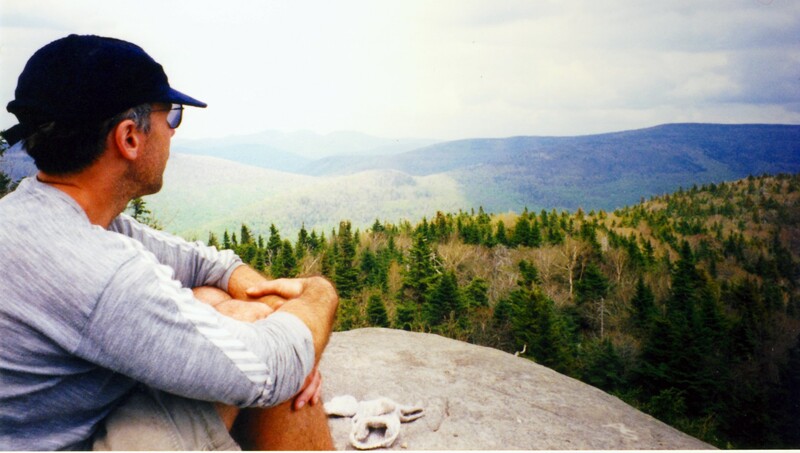 Since I have only been able to do local hikes lately (mainly MST sections near Asheville), I am going to time-travel back to May 29, 1996, when Bob and I knocked off three mighty Catskill peaks. 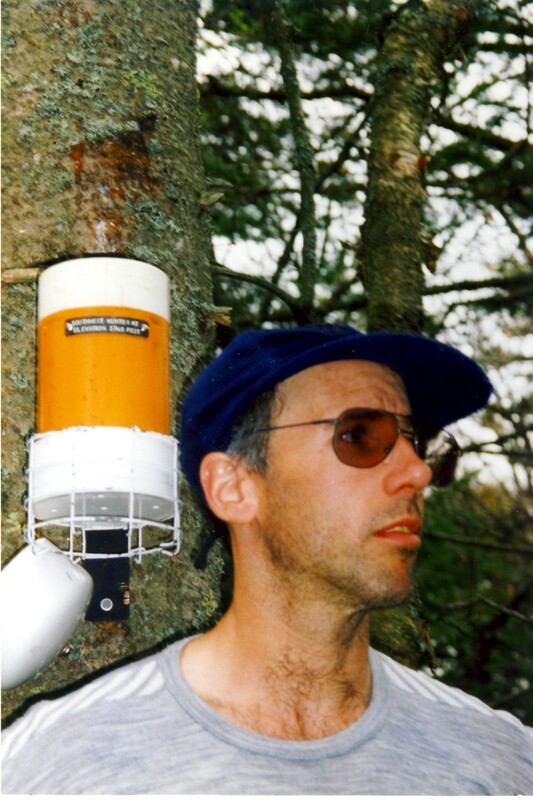 Our first goal was Hunter (4040′), the second highest in the Catskills and one of two that surpass 4000′. We drove into the lovely green Spruceton valley with its old, sometimes rundown, but always interesting farmhouses and cottages. Think of screened porches with rocking chairs, assorted lawn statuary, and carpenters’ ornamentation along the gables. One of the things I like about the area is that its heyday as a vacation spot dates back to the late 1800s and first half of the 1900s. Therefore it has largely escaped the cookie-cutter construction and aesthetic cliches of many more recently developed vacation spots. Hunter is also a ski resort. Its summit can be reached from several different directions by trail or even by walking up the ski slope itself. We followed the wide, rubbly Spruceton trail to its summit, climbing 2000′ in 2.7 miles. We reached the grassy clearing and rested. Unfortunately, since we were there during the single 10-year period that the fire tower was closed to the public in its 102-year history, we could not climb it. The tower was closed in 1989 and nearly demolished, but a movement sprang up to save it, and it was repaired and reopened in 2000. Now it was time to tackle the real challenge of the day, Southwest Hunter (3740′)—a bushwhack peak. 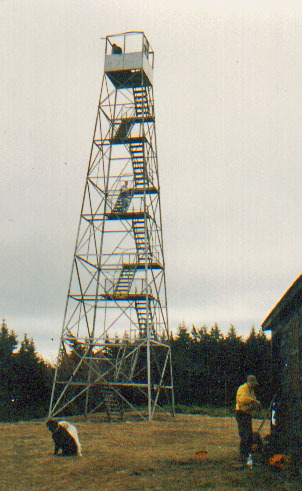 The difficulty lies in finding the right spot to leave the Devil’s Path and plunge into the spruce-fir forest, and then locating the actual high point along a wide, densely overgrown, nearly flat summit plateau. Some people describe SW Hunter as one of the most difficult bushwhacks on the peakbagging list. As he always did with the Catskill registers, Bob drew a picture of a space ship and wrote, “You have been invaded by aliens from Massachusetts! Beware!” (A reference to the fact that no one from eastern Mass. went to the Catskills—except us.) I took the picture at top. When looking at Bob’s facial expression, bear in mind that his sole intent is to throw you off. We then dropped off the northwest side into the valley of the West Kill, a beautiful stream. It made for delightful rockhopping. We maneuvered easily down its flat-topped rocks and eventually reached Diamond Notch. There we left the stream and picked up the Devil’s Path once again to climb 1300 vertical feet up to West Kill (3880′). It has a wonderful wide, smooth ledge near the summit with a commanding view to the southeast. The luminous green of spring had flooded the valleys and was marching its way up the slopes. 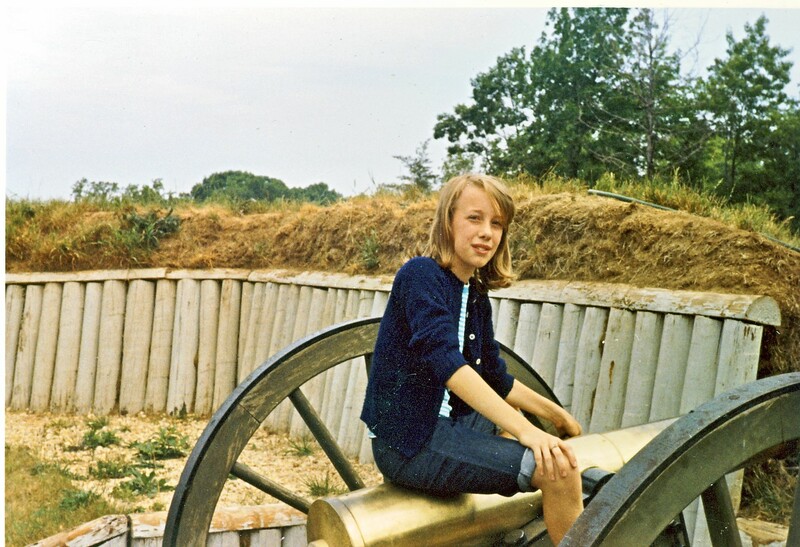 Posted by Jenny in Civil War, memoir, travel. In 2008, I wrote about road trips I’d taken out west in a blog entitled A long-attention-span-kind-of thing. This is a sequel of sorts, and it is also an introduction to a series of posts about U.S. highway travel. We look for where the Queen Anne’s Lace stops and the sunflowers start, for our first prairie dog of the trip and our first antelope. We go out to the Ponderosa pines, up to the Douglas firs, and down to the red rock canyons. We admire vast forests of black spruce by Lake Superior, and perpetual-motion black oil rigs in Wyoming. The transitions happen very gradually, as is enormously appropriate for the gigantic spaces of our huge United States. We tune into Kansas public radio and hear a feature about deep-fried Snickers bars. We drive through hailstorms in Pennsylvania and snow squalls in Utah. We see the Corn Palace in Mitchell, South Dakota, and use the 11,312′–elevation rest rooms at Monarch Pass, Colorado. My travel began with a drive up to Massachusetts to be with my sister during her surgery for breast cancer. I do not count this as part of the road trip despite its 900 miles of driving. This was a goal-oriented journey in which the miles were largely unenjoyable, simply counted off; progress was measured by reaching the next gas station or rest area. 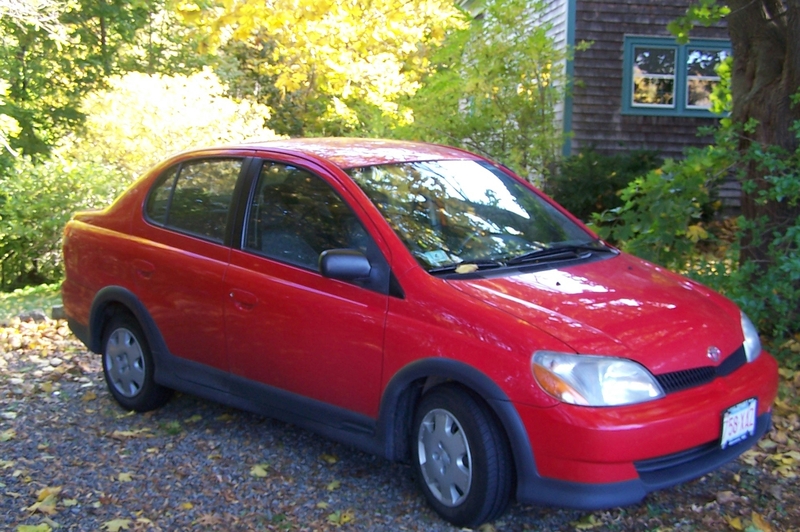 Much of the journey involved overcrowded, stress-ridden northeastern highways such as I-84 and the Mass Pike. And for some years now, I-81 along the Shenandoah Valley in Virginia, formerly an enjoyable drive over rolling green hills, has been much too crowded, an endless procession of tractor-trailers that lumber up the long grades and rampage down them. But even this segment contained a couple of pleasant episodes. I woke up at 3:00 in the morning in my motel at Martinsburg, WV, and decided I might as well head on out in the light traffic. The sun finally rose as I was driving the eerie high-elevation anthracite country around Hazleton and Wilkes-Barre, PA. I am always struck here by the vast expanses of wind-twisted, stunted birch that grow across the old mines, which have now been reabsorbed into the land nearly to the point of invisibility. A few old anthracite breakers still stand in this lonely landscape, but not much remains from the heyday of anthracite production 100 years ago. Anthracite, with its low sulfur and ash content, was considered the clean coal of the day. As the Lackawanna Railroad advised lady passengers concerned about soot coming in through the open windows: Your gown stays bright/ From noon till night/ On the road that burns/ The anthracite. As I drove along this plateau, staying above 2,000′ for many miles, a vast fleecy undercast of cloud slowly turned a glowing pink that progressively saturated the atmosphere. I admired this seamless transition for a long time until the rising sun finally replaced the colors with a dazzling white light. From Scranton, I-84 East became more and more clogged. But I had an escape plan: the Taconic Parkway. As soon as I turned north on it, the traffic simply disappeared. I drove through its familiar green tunnel, watching for deer, catching glimpses of the blue-tinted Catskills across the Hudson. That was my second pleasant episode, and it ended the moment I exited the parkway at its north end. Five days later, the road trip proper began. Here’s a simple definition: a road trip consists of travel for the enjoyment of it rather than simply to get from Point A to Point B. And this particular road trip fell into a special category: it was an improvisational road trip. The only thing I knew for sure was that Gettysburg would be my first destination. My two guiding themes were “state high points” and “Civil War battlefields.” But which high points, exactly, and which battlefields? For instance, I wanted to go to Shiloh, but I wasn’t sure I would get all the way out to West Tennessee. As the days went by and I had many adventures and saw many wonderful things, I began to experience the most lovely feeling of freedom. Each evening in my motel, I would study my atlas, decide what I was in the mood for, plot out a route, and write it down in big letters on a piece of paper that I could put on the passenger seat and glance at while I was driving. No, don’t want no stinkin’ GPS. From Gettysburg to Frostburg, MD, was a beautiful drive. It took me on historic US Hwy. 30—known as the Lincoln Highway—over the dramatic twists and turns of the Tuscarora Summit. I then turned south through a sunny valley of thriving farms, drove through McConnellsburg, PA, and reached I-68. I was awestruck when I saw the road cut pictured at top. A rest area at the road cut offers a walkway along one of its precipitous sides, with plenty of interpretive signs. The signs explained how in the old days of US Hwy. 40, another historic highway (the “National Road”), drivers had to negotiate five treacherous hills on the way to Cumberland, MD. Frequently, cars plunged over the dropoffs—one of the signs showed an old-time advertisement for a “Pull-U-Out” winch that could be used to hoist your car back up to the road. 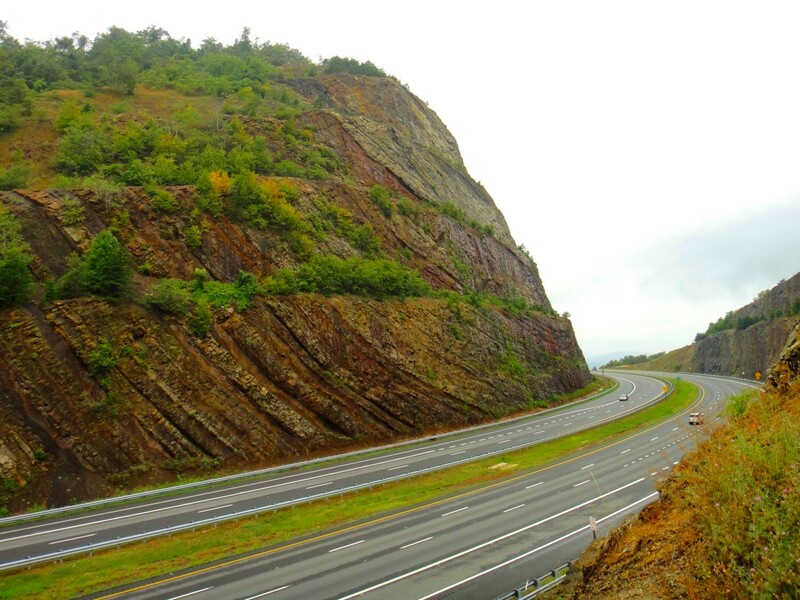 With the building of I-68, a monumental road cut project was launched for the 350-million-year-old sandstone and claystone of Sidelong Hill. The cut is 4.5 miles long, 380′ deep, and 200′ wide. The two-year job cost $20m in blasting and opened in 1985, the deepest road cut in Maryland history. Exciting, huh? Whether or not you are interested in historical details like that might be a good indicator of whether you are a likely candidate for a long road trip. Personally, I find these things fascinating. As I went along, from Gettysburg to the three state high points (PA, MD, WV), to Dolly Sods to Fort Donelson to Shiloh to Brasstown Bald, I started thinking about the contrast between this vacation and the one I had last year, when I went to South Africa. For me, that was a trip of a lifetime: visiting the Boer War battlefields with a group that knew the subject deeply, staying at a vacation place on the border of Kruger National Park. Yet this year’s road trip offered something missing from the other—complete independence. And a continual unfolding of the unexpected. 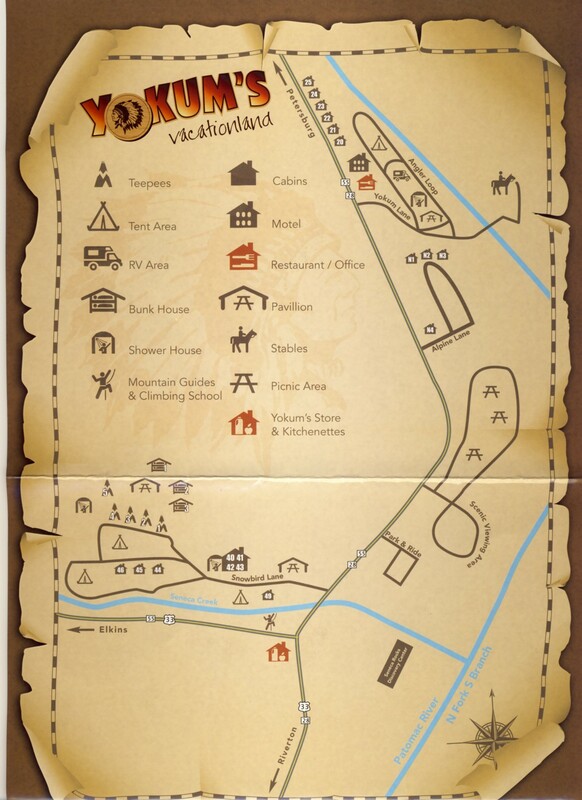 Who could have guessed that I would end up staying at Yokum’s Vacationland in Seneca Rocks, WV? That I would get the room for $30? That it would feature real pine panelling and a prehistoric television (which didn’t matter to me)? Motels loomed large in my travel experience. Much to my surprise, I had my most unhappy experience in Frostburg, MD. I thought for sure I’d find a nice, inexpensive motel out there in the western end of the state. Turned out there was a convention of firemen in town that weekend. The first two motels I tried were full. I caved in, tired and unwilling to drive on to the next town, and ended up at Hampton Inn for a whopping $110. It was one of two Hampton Inns that I got stuck with (the other in Martinsburg on the way up). They are a perfect example of corporate packaging, all glossy and polished, the beds loaded with superfluous, foofy-looking pillows, the TV concealed in a coffin-like cabinet, the bathtub hidden behind a shower curtain on a rod that arched out rather than going in a straight line (is that the latest home-decorating trend?). The only saving grace in Frostburg was that a beautiful rainbow shone outside my window when I first entered my room. That must have been worth $10 or $15 at least. These motels cater to people who are afraid of the dark unknown represented by the small independent motel, who partake of the current trend in American culture for everything to be… I don’t know how to describe it exactly… fancier than it used to be. That is the word my mother would have used. “This is too fancy for me,” she would say, putting an ironic twist on the word as she shook her head disapprovingly. She didn’t need the extra features, the more complex technology, the infinite consumer options. Far better were my experiences at the “Swiss Villa Inn” in Paris, TN, and the “Winchester Inn” in Winchester, TN—both run by Indians. Their large and comfortable rooms featured an idiosyncratic mix of furnishings. The Winchester room had a sort of sitting room in the front, with a couch whose fake leather cushions squeaked when I sat on it, and a bedroom in the back with curtains of Indian fabric. The bathroom had come in a time machine out of the 1950s, but it was clean. The Swiss Villa room boasted a king-size bed with extremely comfortable pillows and had a surprisingly good abstract art reproduction on the wall. I learned from reading an excellent article in the New York Times that more than 50% of all U.S. motels are owned by people of Indian origin. They own many of the “mom and pop” operations, but they are also frequently found running Holiday Inns, Ramadas, Comfort Inns, and the like. To compound the curiosity of this “nonlinear ethnic niche,” as the NYT article calls it, about 70% of Indian motel owners in the U.S. have the last name of Patel. The “nonlinear” refers to the lack of an inherent connection between the occupation and the ethnic group: it is a specialty that originated largely by chance. Once the first Patels came over in the 1940s from Gujarat state in western India, their friends and relatives followed suit, recognizing the benefits of an occupation where hard work mattered more than fluent English. Sitting in my room at the Swiss Villa Inn, I realized that I had arrived at a mysterious and wonderful confluence: I was in an Indian-run motel in West Tennessee, about to go out for a dinner of fried catfish and hush puppies, served on a paper plate, in a town named after a sophisticated European city. From there I would follow the path of thousands of Union and Confederate troops who had passed nearby 149 years earlier on their way to Shiloh, called after the small log church named in turn for the ancient town in Israel that was a center of worship for 300 years before Jerusalem. I would walk the haunted fields of Shiloh, then decide to head to the mountains of north Georgia, my little red car swooping around the bends of the fast two-lane highways. I will next conclude my long-interrupted series on Germania, then begin my series on U.S. highways.